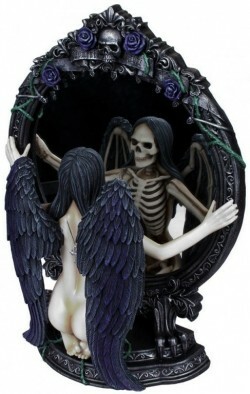 Gothic angel staring at her skeleton reflection in the mirror. Purple tones to her wings and four purple roses decorating the mirror. Excellent display piece for the gothic home. Felted on the base and rear of the mirror to protect surfaces. High grade resin construction results in a weighty and solid feel. Stone statue look and feel.